Amadeus Mozart appears in Italy with a certainty of his skill, an arrogance and a lewd sense of humour. He personally offends everyone’s sensibilities and his music is ahead of its time but not to Antonio Salieri’s ear. Salieri can hear that Mozart’s work has a touch of genius and to his mind a connection to the divine. Salieri brands Mozart his artistic nemesis and having lived a virtuous life of teaching and charitable actions in Vienna cannot stomach the fact God has not blessed him with similar talents. 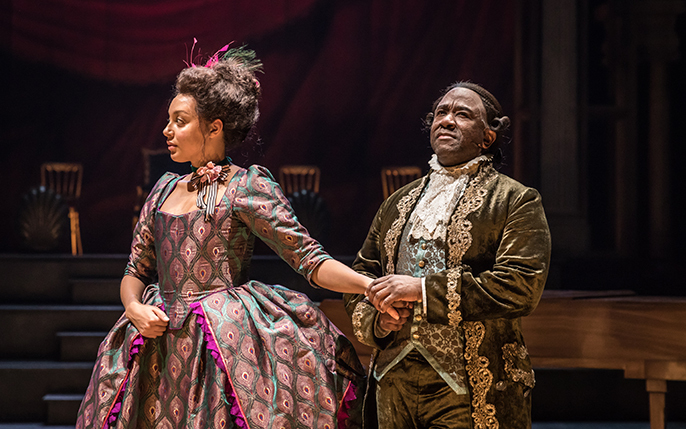 The depth of Salieri’s hatred, jealousy and self-pity are what Peter Shaffer wanted to explore when he wrote Amadeus, originally staged in the National Theatre in 1979, now brought to life in 2016 and again in 2018 version. 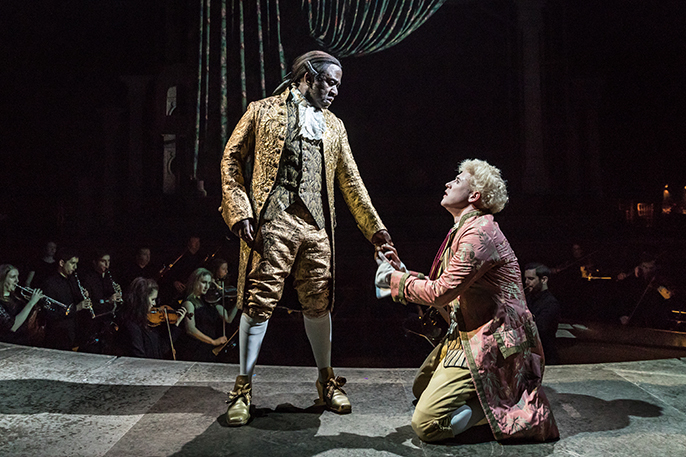 This stunning revival, hot on the heels of the similarly incredible Follies, manages to impress in its performance prowess as an ensemble piece and an utterly virtuoso turn from Lucian Msamati as Salieri. For this play is his play, it’s Salieri’s final aria from his deathbed but also his bitter confession of the spite he poured into Mozart’s life. Each step that Mozart takes, Salieri walks behind him exerting his power to damage his work, his reputation and opportunities. So, it is in these actions that the play manages to starkly connect with current day issues, as powerful men in the art world fall from their pedestals for sexual misconduct, we have a scene where Mozart’s wife steps into the den of the wolf to beg assistance from Salieri. Little does she know that she is asking for favours from a false friend but also a man who covets her and has long since turned his back on his God and therefore previous life of virtue. The fascinating and more condemning aspect of Salieri’s actions is the fact his work is generally better received in 1780’s Vienna but it is as if he can sense that unlike him Mozart’s work will be immortal. Msamati’s performance follows a heart-breaking path of a realisation of the darkness within himself, a shattering of his naive understanding of God and that talent is not delivered to us all equally. 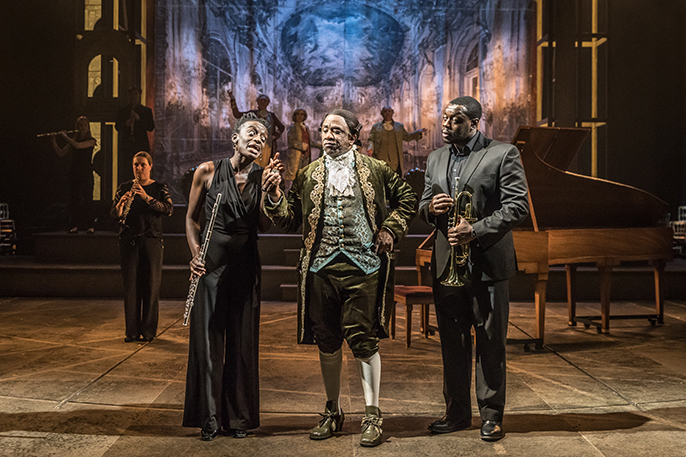 Themes of power, jealousy and betrayal are always strong foundations to create theatre but Amadeus on the Olivier stage with Michael Longhurst’s direction goes to dizzying heights. The darkest of moments are balanced with brilliant humour and farce all led by the energetic and bawdy Mozart played by Adam Gillen. Longhurst has also transformed the Southbank Sinfonia into a simply superb performance troupe that play the majority of the music from memory and fill the stage with confident physicality. Last but not least is the show’s playfulness with all its elements. The art design is beautifully anachronistic, with Viennese costumes sported alongside gold trainers and Salieri’s favourite Italian desserts sitting happily with contemporary doughnuts. This also combines with a varied use of all the languages that would have been present in 18th century Vienna especially in the international upper-class music world. 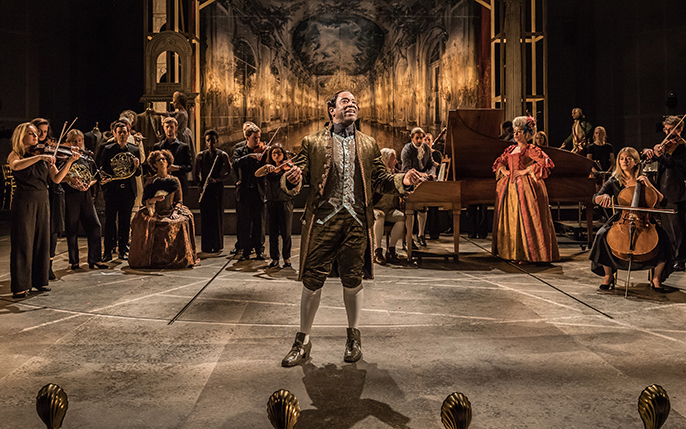 Amadeus is a stunning, hilariously funny and timely masterclass of performance. I left the theatre wowed but also contemplating the ability for powerful egotistical men to destroy lives on a whim. A dramatic love letter to Mozart’s music and truly great theatre.